Have you seen this “Baniwi” video floating around your Facebook feed? The video, featuring a soft-spoken man in a crisp button-up, shares how to combine a kiwi with a banana, and consequently blew the minds of people around the world—mostly gullible ones. Although this video may be completely impossible and untrue, it embodies all our fondness for Robert Mahar’s creative mind. Robert, who we like to refer to as a “crafty jack-of-all trades,” teaches fun and clever DIY projects through online video tutorials and in-person workshops. Plus, he makes everything look like it’s a breeze (even for DIY beginners). 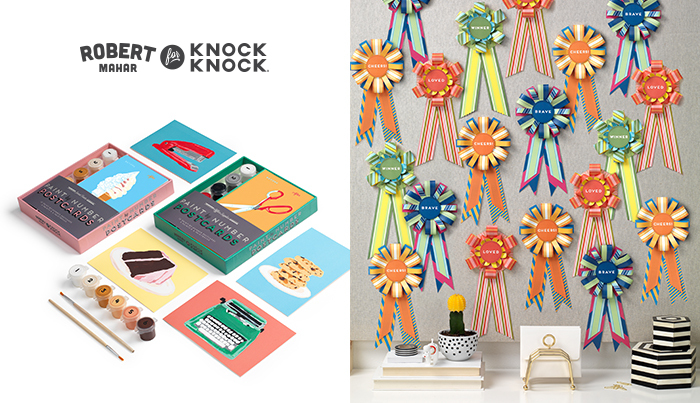 Knock Knock recently collaborated with Robert to create our new Paint-by-Number Postcard Kits and Personal Awards Ribbons—craft lovers rejoice! These six vintage-inspired gifts, including the paint by number for adults kits, perfectly illustrate Robert’s talent for reinventing old-school crafts with a decidedly modern twist. His niche style has gained him a very loyal following. 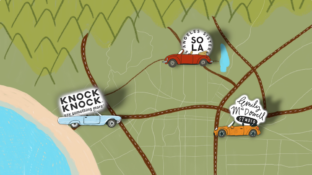 Robert Mahar for Knock Knock items include Sweet Treats Paint-by-Number Postcards, Office Supplies Paint-by-Number Postcards, and Cheers!, Brave, Loved, and Winner Personal Award Ribbons. Growing up, Robert was always the kid who would rather stay inside and bake Shrinky Dinks than run around in the backyard. Robert said that while no one in his immediate family was particularly crafty, they humored his obsession with Childcraft encyclopedia’s Make and Do volume. In college, Robert switched his major from Studio Arts to Art History, and the rest is, well, history. 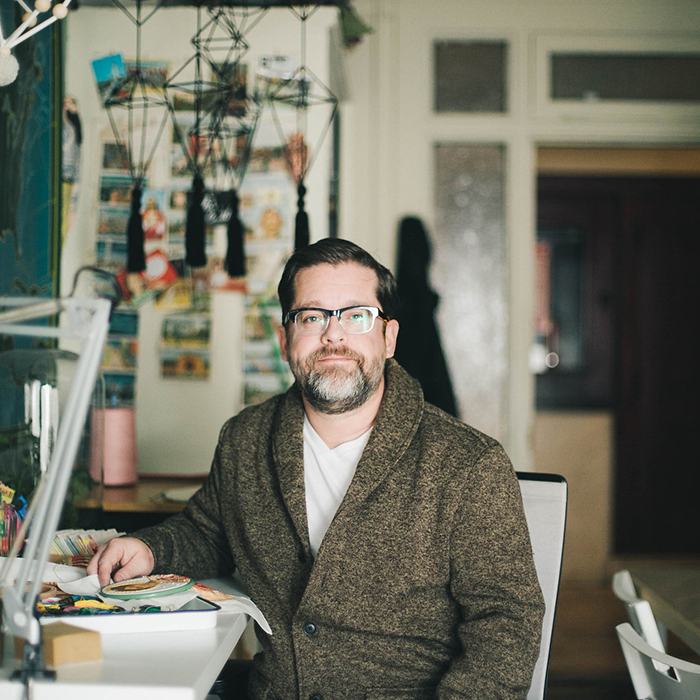 Now, he spends his time working in his downtown Los Angeles studio creating inspiring and inventive vintage crafts while simultaneously scheming ways to make it big as a doughnut connoisseur (more on that below). 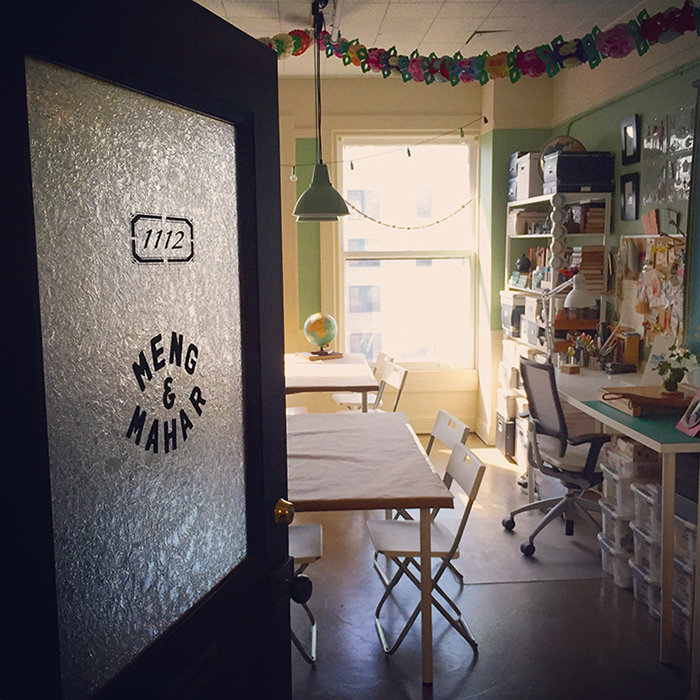 A peek inside Robert’s downtown Los Angeles studio. 1. Who were your creative role models growing up? A man who valued kindness, creativity, and a smart button-up cardigan: Fred Rogers. We had a standing weekday television date for several years during the 1970s. His factory tour forever solidified my love affair with crayons and my fascination with how things are made. 2. You’ve worked in a variety of creative fields since you first started out. What advice would you give to other creative entrepreneurs interested in exploring different paths or career options? I’ve become a big believer in embracing the opportunity and (sometimes the necessity of) pursuing more than one career in a lifetime. A career change can be both exhilarating and filled with uncertainty—what Gilda Radner once referred to as life’s “delicious ambiguity.” If you’re considering a new path, my best advice is to identify good people doing great work in the field you want to pursue and get to know them. Hard work and happy alliances lead to good things. Robert wasn’t kidding! This is “delightfully absurd.” We’re positive that Martha enjoyed it, too. 3. Is there a defining moment in your career when you felt like you were really fulfilling your passion? What is your proudest moment so far? In October of 2009, I was invited to be a guest on the Martha Stewart Show, where I had the great pleasure of teaching the “Queen of Halloween” how to create a delightfully absurd plush-skeleton from a pair of athletic socks. Martha has long been a crafty hero of mine and this tiny little moment in my creative life was pure joy. If you watch it, might I suggest making a game of it? Take a shot or eat an M&M every time my beardless baby-face says the word “exactly”—you’re guaranteed to end up drunk or diabetic. 4. Where do you find the most inspiration for your imaginative crafts and DIY projects? Some of my best ideas have started from the pages of a vintage how-to, hobby, or rainy-day activity book. My favorite volumes are from the 1930s, ‘40s, and ‘50s. I love this so hard because it’s true! Sometimes you just have to work through bad ideas and crappy first, second, and sometimes third drafts before you get to the good stuff. 6. Do you have any hobbies outside of crafting and other creative projects? I consider myself a donut enthusiast. Tenaciously searching for the perfect Long John iced in chocolate and filled with homemade cream is a legit hobby, right? 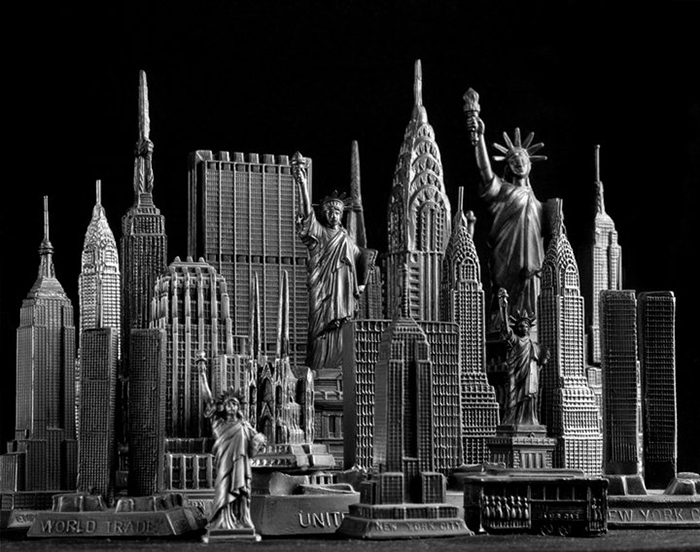 I also collect vintage, miniature-souvenir buildings. My first was an Empire State Building (complete with the thermometer) purchased during an early visit to New York. Twenty-five years later, 300+ structures create imaginary cityscapes on my bookshelves. One of Robert’s imaginary cityscapes. Photo by David Daigle. I’m a little obsessed with the documentary series Chef’s Table. How amazing would it be to travel the globe visiting every restaurant featured? It’s less bucket list and more of a lottery-winner fantasy. I am not a tiny man, but I love the idea of a tiny house. It would be fun to try living in a well-designed sardine can (with the option to return to normal size when the novelty wears off). I would like to pet llamas in the Peruvian Highlands and then see if some ridiculously talented artisans can teach me how to knit. I’ve taken multiple lessons and it just won’t stick! Seriously, the knitting tradition/culture in Peru makes me so happy. Stay up-to-date on Robert’s newest crafts on his website and YouTube channel, and follow him on Instagram (@robert_mahar), Pinterest, and Twitter. Main photo by Kate Edwards. Wow! How fun to catch this on FB! A long way from GR and making a name for yourself. Congratulations! I’ll keep my eye out for the perfect Long John, maybe Marge’s Donut Den has one.